Hayagreeva is an incarnation of Vishnu with the horse head and is believed to be the storehouse of knowledge. Agasthya is one of the great sages of yore who is one of the stars of the constellation great bear. 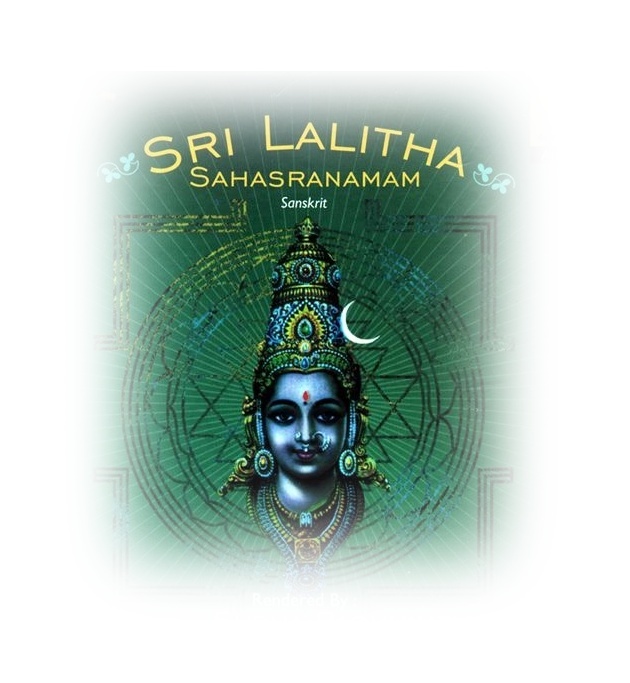 At his request Hayagreeva taught him the most holy 1000 names of Lalitha . Parama shiva is one of the trinity of Hindu pantheons who is in charge of destruction. He married Sathi, the daughter of Daksha. Daksha and Paramashiva were not getting on well and consequently he did not invite Paramashiva for one of the great fire sacrifices that he conducted. However Sathi went to attend the function in spite of Paramashiva’s protest. Daksha insulted her husband and she jumped in to the fire and ended her life. Consequently at the behest Of Paramashiva Daksha was killed and later given life with a goat’s head. However this incident of his most loveing wife Sati upset Paramashiva and he entered into deep meditation.Sathi took rebirth as the daughter of the mountain(Parvathy) Himalayas and started doing penance on Shiva for getting him as her husband. The devas faced a very great enemy in Sura Padma who had a boon that he could be killed only by a son of Shiva and Parvathy. So to wake Shiva from his deep meditation the devas deputed Manmatha, the God of love who shot his flower arrows at Paramashiva. Paramashiva woke up and opened his third eye and burnt the God of love into ashes. The Devas and Devi Rathi the wife of Manmatha requested Paramashiva to give life to Manmatha. Heeding for their request Paramashiva stared at the ashes of Manmatha.From the ashes came Bhandasura Who made all the world as impotent and ruled from the city called Shonitha pura.He started troubling the devas.The devas then sought the advice of Sage Narada who advised them to conduct a fire sacrifice. 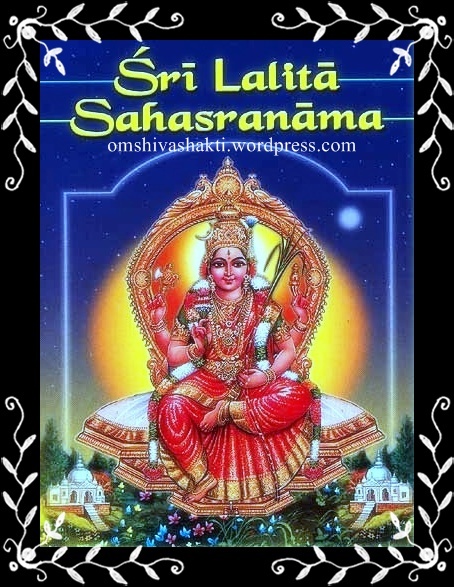 From the fire rose Sri Lalitha Tripura Sundari. She was extremely beautiful, having dark thick long hair with scent of Champaka, Asoka and Punnaga flowers, having the musk thilaka on her forehead, Having eyelids which appeared as if it is the gate of the house of God of love ,having eyes which were like fish playing in the beauteous lake of her face, Having nose with studs which shined more than the stars, Having ears with sun and moon as studs, having cheeks which were like mirror of Padmaraga, Having beautiful rows of white teeth, Chewing Thamboola with camphor, having voice sweeter than the sound emanating from Veena of Sarswathi, Having such a beautiful smile that Lord Shiva himself could not take his eyes off, Wearing Mangala soothra and necklaces with beautiful shining dollars, Having breasts which were capable of buying the invaluable love of Kameswara (Lord Shiva), having row of faint beautiful hair raising from her belly, having stomach with three pretty folds, wearing red silk tied with a string with red bells. Having thighs which steal the heart of (Shiva) Kameshwara, Having knees which looked like crowns made of precious gems, having voluptuous legs, having upper part of the feet resembling the back of tortoise, Having feet which resembled the lamps made of gems which could dispel worries from the mind of devotees and a body with the golden red colour. She was given in marriage to Lord Kameshwara and made to stay in Sree Nagara at the top of Maha Meru Mountain. Sree nagara had 25 streets circling it. They are made of iron, steel, copper, lead, alloy made of five metals, silver, gold, the white Pushpa raga stone, the red Padmaraga stone. Onyx, diamond, Vaidoorya, Indra neela (topaz), pearl, Marakatha, coral, nine gems and mixture of gems and precious stones. In the eighth street was the forest of Kadambas. This is presided by Syamala. In the fifteenth street live the Ashta Digh palakas.In the sixteenth lives Varahi alias Dandini who is her commander in chief. Here Syamala also has a house. In the seventeenth street live the different Yoginis.In the eighteenth street lives Maha Vishnu.In the nineteenth street lives Esana, in the twentieth Thara Devi, twenty first Varuni , the twenty second Kurukulla who presides over the fort of pride, twenty third Marthanda Bhairawa, twenty fourth the moon and twenty fifth Manmatha presiding over the forest of love. In the center of Srinagara is the Maha Padma Vana(The great lotus forest) and within it the Chintamani Griha (The house of holy thought),In its north east is the Chid agni kunda and on both sides of its eastern gate are the houses of Manthrini and Dhandini.On its four gates stand the Chaduramnaya gods for watch and ward. And within it is the Sri chakra.In the center of Sri Chakra on the throne of Pancha brahmas on the Bindu Peeta(dot plank) called sarvanandamaya(universal happiness) Sits Maha Tripura Sundari.In the Sri Chakra are the following decorations viz., The square called Trilokya mohanam(most beautiful in the three worlds), The sixteen petalled lotus called Sarvasa paripoorakam(fulfiller of all desires), the eight petalled lotus called Sarvasamksopanam(the all cleanser), the sixteen corner figure called Sarva sowbagyam(all luck),the external ten cornered figure called Sarvartha sadhakam (giver of all assets), the internal ten cornered figure called Sarva raksha karam(All protector), the eight cornered figure called Sarva roka haram(cure of all diseases), triangle called Sarva siddhi pradam(giver of all powers) and the dot called Sarvananda mayam(all pleasures). The devas prayed her to kill Bhandasura. 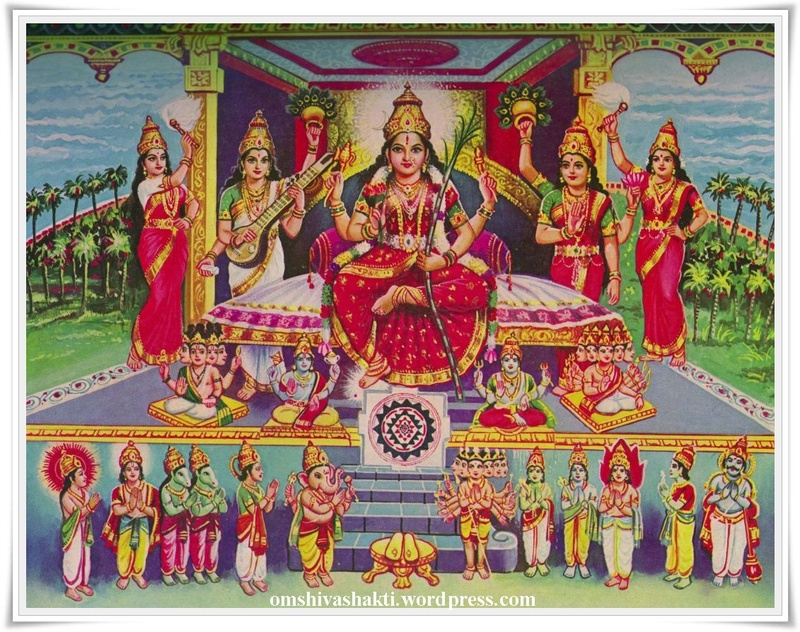 When she started for the war with Bandasura, she was accompanied by the powers called anima, mahima etc, Brahmi, Kaumari, Vaishnavi, Varahi, Mahendri, Chamundi, Maha Lakshmi, , Nitya Devaths and Avarna Devathas who occupy the Sri Chakra.While Sampatkari devi was the captain of the elephant regiment, Aswarooda devi was the captain of the cavalry. The army was commanded by Dhandini riding on the Charriot called Giri Chakra assisted by Manthrini riding on the chariot called Geya Chakra. Jwala malini protected the army by creating a fire ring around it. ParaShakthi rode in the center on the chariot of Sri Chakra.Nithya Devi destroyed a large chunk of Bandasura’s armies , Bala Devi killed the son of Bandasura, and Manthrini and Dhandini killed his brothers called Vishanga and Vishukra. When the Asuras created blockade for the marching army, Sri Lalitha Tripura sundari created Ganesha with the help of Kameshwara to remove the blockade.Then Bandasura created the asuras called Hiranyaksha, Hiranya Kasipu and Ravana.The Devi created the ten avatars of Vishnu and destroyed them. She killed all his army using Pasupathastra and killed him with Kameshwarasthra. The gods then praised her.She then recreated Manmatha for the good of the world. This story is contained in the first 84 names of the first 34 slokas of Lalitha Sahasra nama .and all together contains one thousand names. This is also called the Rahasya Nama Sahasra(the thousand secret names).Reading it , meditating on the meaning of the names would lead to the fulfillment of all the wishes of the devotees. *	9	*	Krodhakarankusojwala	–	She who glitters and has anger in the form of Anghusa –in one of her right hands. * 34 * Nabhyala vala Romali latha phala kucha dwayi – She who has two breasts that are like fruits borne on the creeper of tiny hairs raising from her belly. *	81	*	Maha pasupathasthragni nirdagdhasura sainika	–	She who destroyed the army of asuras by the Maha pasupatha arrow. * 82 * Kameshwarasthra nirdhagdha sabandasura sunyaka – She who destroyed Bandasura and his city called sunyaka by the Kameshwara arrow. * 99 * Moladharaika nilaya – She who exists in Mooladhara In Mooladhara which is in the form of four petalled lotus the kundalini sleeps. * 100 * Brhama Grandhi Vibhedini – She who breaks the tie in Brahma grandhi i.e she who helps us to cross the ties due to our birth. * 102 * Vishnu grandhi vibedhini – She who breaks the ties of Vishnu grandhi i.e she who helps us cross the ties due to our position. *	742	*	Bhava dhava sudha vrishti	–	She who douses the forest fire of the sad life of mortals with a rain of nectar. *	744	*	Daurbhagya thoolavathoola	–	She who is the cyclone that blows away the cotton of bad luck. *	1000	*	Lalithambika	–	The easily approachable mother.